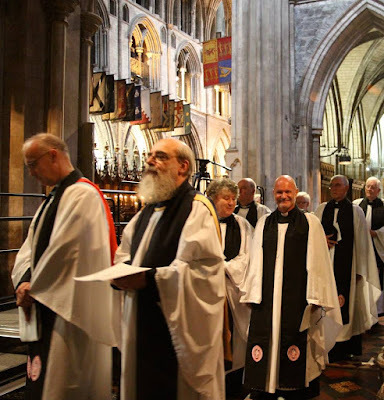 The Dean of Christ Church Cathedral, the Very Revd Dermot Dunne, and many chapter members robed and processed at the recent installation of the Very Revd William Morton (59) as the new Dean of Saint Patrick’s Cathedral, Dublin. Dean Morton is a former Dean of Saint Columb’s Cathedral, Derry, and from 2013 he had represented the Diocese of Derry and Raphoe in the chapter of Saint Patrick’s as Prebendary of Howth. The installation of the new Dean of Saint Patrick’s on 24 September was attended by President Michael D Higgins, the First Minister of Northern Ireland, Arlene Foster, and the Deputy First Minister, Martin McGuinness. The preacher was the former Archdeacon of Raphoe, Archdeacon Scott Harte. Later that afternoon, a reception for the new dean was hosted in the nave of Christ Church Cathedral. Dean Morton was elected Dean of Saint Patrick’s Cathedral in succession to the Very Revd Victor Stacey, who retired at the end of March. The new dean is deeply committed to the arts, and diversified the role of Saint Columb’s Cathedral in hosting a number of cross-community and ecumenical events in the form of exhibitions, lectures, seminars and guided tours. He has also been very involved in several community initiatives. Dean Morton was Dean of Derry from 1997. He was educated at Trinity College, Dublin and obtained a PhD from Queen’s University, Belfast, in 1996. He was ordained deacon in 1988 and priest in 1989. Prior to becoming Dean of Derry he was Rector of Conwal Union (Letterkenny) (Derry and Raphoe) from 1991 to 1997 and Curate of Drumachose (Derry and Raphoe) from 1988 to 1991. He was appointed Deputy Lieutenant for the City of Londonderry in October 2014. This full-page report is published in the current edition of the ‘Friends’ News,’ Christ Church Cathedral, Dublin (Autumn 2016, Vol 34, No 2), p 21. During my visit to Kraków this week, I was staying in the heart of the old Jewish District of Kazimierz, where the synagogues form an outstanding collection of monuments of Jewish sacred architecture unmatched anywhere in Poland. The seven main synagogues in this part of Kraków form one of the largest complexes of this kind in Europe, second only to Prague. This unique district has been on the list of Unesco world heritage sites since 1978. From the early 12th century, Kraków was an influential centre of Jewish spiritual life, including Orthodox, Chasidic and Reform communities that all flourished side-by-side. Before the Nazi German invasion of Poland, Kraków had a Jewish community of 60,000-80,000 people in a city with a population of 237,000, and there were at least 90 Jewish prayer houses. The synagogues of Kraków represent virtually all the European architectural styles, including the Gothic, Renaissance, Baroque, Neoclassical, and the Modernist. During this week, I visited seven of the most prominent synagogues in Kazimierz: the Old Synagogue, the High Synagogue, Remuh Synagogue, Wolf Popper Synagogue, the Tempel Synagogue, Kupa Synagogue and the Izaak Jakubowicz Synagogue. Three of these synagogues are still active, some also serve as houses of prayer, and the district also has two Jewish cemeteries. The Old Synagogue (Synagoga Stara), at the south end of Szeroka Street, was built in 1407, making it the oldest Jewish house of prayer in Poland. The present appearance of the building dates dates from remodelling between 1557 and 1570. The parapet and Gothic interior, with ribbed vaulting supported by slender columns, date from this period. In accordance with Jewish traditional practices, the interior of the hall is almost bare. The east wall retains its ornamental aron hakodesh or sanctuary for the Torah scrolls. The only item of furniture is the bimah or reading desk used for reading the Torah, with its surrounding decorative ironwork. Today, the Old Synagogue houses the Galicia Jewish Museum. The museum exhibits include synagogue furnishings and objects, items used in Jewish rituals and festivals, display boards on the history of the Kazimierz District, and the story of the Holocaust. The numerous items related to religious ceremonies include candle holders, both Chanukah and menorot lamps, covers for the Torah, parochot Holy Ark covers, tallit prayer shawls, and kippahs or yarmulkes. The collection of books and prints includes 2,500 volumes of Hebrew manuscripts. The paintings on the walls include oil paintings by Maurycy Gottlieb, Józef Mehoffer, Tadeusz Popiel, Jerzy Potrzebowski and Jonasz Stern. On the plaza in front of the synagogue commemorates a group of local people who were murdered for their resistance to the Nazis. On the west side of Szeroka Street, the Remu'h Synagogue is one of the few functioning synagogues in Kraków. This synagogues was built in the middle of the old row houses (kamienice), it was founded in 1553-1556 by a royal banker, Israel Isserls Auerbach, for his own son the great philosopher and writer, Rabbi Moses Isserles. Rabbi Moses was also known as Remu'h, and before he had even reached adulthood he was known for his erudition and as a miracle worker. The Remu'h Cemetery behind the synagogue was also named after him. Inside, there is a beautiful aron hakodesh and a bimah with surrounding decorative ironwork and decorated wooden doors. The monuments and plaques in the courtyard include one to the Righteous of the Nations. Behind the Remu'h Synagogue, the Remu'h Cemetery has both gravestones and sarcophogi with rich floral and animal decorations. Most of the graves and tombs were destroyed by the Nazis during World War II, but many have been restored in recent decades, and the fragments of others have been reassembled in a jigsaw style on the east wall as a memorial to the victims of the Holocaust. Across the street from the Remu'h Synagogue, on the east side of Szeroka Street, the Synagogue of Wolf Popper is now an exhibition centre, hosting exhibitions and often hosting artists in residence. The High Synagogue or Synagoga Wysoka on Jozefa Street is the third oldest synagogue in Kraków. With its Gothic architecture and Renaissance decoration it is one of the most picturesque synagogues in the city. It was built in 1556-1563 in a Romanesque style, with a Renaissance portal. The ground floor was rented out to shopkeepers and now houses an important Jewish bookshop. The main synagogue was upstairs on the first floor, where part of the aron hakodesh survives in the east wall. Today, this floor is used for exhibitions, and the current exhibition documents Jewish families in the area in the inter-war years, many of whom were transported forcibly to Auschwitz, Birkenau and other death camps and died in the Holocaust. Isaak’s Synagogue or the Isaak Jakubowicz Synagogue on Kupa Street was founded by Isaak Jakubowicz, a leading member of the Jewish community in the 17th century and was built in 1644. Inside, the synagogue has a barrel vaulted ceiling, a large nave and plaster work by Giovanni Batista Falconi. Today, this synagogue houses Kraków’s Chabad Lubavitch community and the Jewish Education Centre. At the top of Kupa Street, the Kupa Synagogue, also known as the Hospital Synagogue, dates from 1643. It was founded by the Jewish district’s kehilla or local government as foundation for the local kahal. It was rebuilt in the 1830s. After World War II, the Kupa Synagogue provided refuge for Jewish people repatriated from the Soviet Union, and was later used as a factory. But in recent years it has been renovated, and the aron hakodesh, the walls and the ceilings were restored. The Tempel Synagogue on Miodowa Street is the most recent synagogue in Kraków. It was built between 1860 and 1862, when Kraków was part of the Austro-Hungarian Empire, and its Neo-Renaissance design, with Moorish influences, was inspired by the Leopoldstädter Tempel in Vienna. It is used by non-Orthodox Jews, and has impressive stained-glass windows. Most of the synagogues in Kraków were ruined during World War II. The Nazis robbed them of all their ceremonial objects and decorations and used the buildings to store ammunition and military equipment. By the end of the 1940s, the post-Holocaust Jewish population of Kraków had dwindled to about 5,900. A generation later, this number had fallen even more dramatically to about 600. In recent years, many of the synagogues and prayer-houses have been restored, and these seven synagogues are all within walking distance.